The final conference program is available here along with the abstracts. The poster session is available here. The list of conference registrants is available here. In 2005, the first meeting of ISSID to be held in the Southern Hemisphere took place in the Holiday Inn on Hindley Street, Adelaide, South Australia. John Brebner was the conference organizer for the 2005 meeting of the society. The meeting started with registration at the hotel from 2:00 p.m. to 6:00 p.m. on Monday, July 18th, followed by a reception from 6:00 to 8:00 p.m.. It ended at lunchtime on Friday, July 22nd. The conference banquet was held in the evening of Thursday, July 21st. The cost of registration included morning and afternoon coffee, light lunches and the banquet. The Holiday Inn has a very central location close to many inexpensive restaurants, cafes, pubs, and some nightclubs, and within walking distance of the Adelaide Festival Centre which houses several theatres. The Holiday Inn has 181 rooms, all of them with four star facilities including phone, TV, coffee making equipment, small refrigerator and minibar. Parking is available for hotel guests. The city of Adelaide is bounded by four terraces-- North, East, South and West-- each of them one mile long, with parklands surrounding the four terraces and separating the city from the suburbs. North Terrace has many important buildings including the Casino (formerly the railway station), the suburban railway station, State Parliament House, the Governor’s Residence, State Library, Museum, Art Gallery, University of Adelaide, University of South Australia, Royal Adelaide Hospital, Botanical Gardens, and the National Wine Centre. The city has one central square-- Victoria Square-- where Adelaide’s only remaining tram service can take you to Glenelg at the seaside, and to four peripheral squares. Running parallel to North Terrace, the Torrens river separates Adelaide from North Adelaide, which has many good restaurants and pubs. 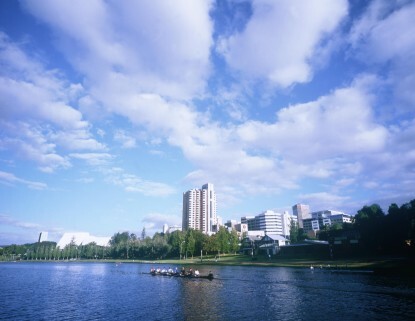 A stroll along the Torrens can be relaxing but it is recommended that you do not do that alone at night. If you would like to become a member of the International Society for the Study of Individual Differences (ISSID), please complete the membership application form below.